Samsung Electronics Co., Ltd. unveiled a powerful compact digital camcorder, the MX20, with its newly developed platform that enables higher video quality and longer recording times. The new MX20 also allows users to upload their files to iPod and YouTube without transcoding the files. With its best-in-class semi-conductor chips and image processing technology, Samsung has developed a new platform offering high video quality, longer recording times and low power consumption for SD camcorders to meet customer’s demands. With the high performance of the new platform, Samsung’s MX20 features the longest battery life in its class – up to three hours. The new MX20 is the first to apply H.264 CODEC to SD camcorders. Compared to SD camcorders using MPEG-2, the MX20’s H.264 enhances video quality and recording times significantly. In the “fine” mode, Samsung’s MX-20 camcorder can record up to 4 hours of footage using an 8GB memory card, 8 hours using a 16GB memory card, and up to 16 hours using a 32GB card. Samsung’s MX20 with H.264 more than doubles the compression ratio so that it takes less time to send video files via email or upload them onto the internet. Focusing on high video quality, Samsung’s MX20 with its new platform is packed with powerful technologies such as 3-D noise reduction technology for smooth video, Samsung’s own edge filter technology for stunning video details and clarity, and color control technology for original and natural colors. The MX20 features a powerful, world-renowned Schneider lens with 34x optical zoom and Samsung’s improved Hyper Digital Image Stabilization, which compensates for the images caused by hand-shaking for sharper footage. The MX20 also includes advanced face detection technology which can automatically detect up to five faces and adjust the focus and diaphragm to ensure better composition. The new model optimizes the video quality with a high-performance 680K-pixel CCD sensor. The MX20 features a unique shooting mode that allows users to select a resolution and format that’s ideal for uploading videos to an iPod or YouTube. Unlike other camcorders, users can easily import the video to iTunes and play it on iPod or other personal media players supporting H.264 without having to transcode the files. 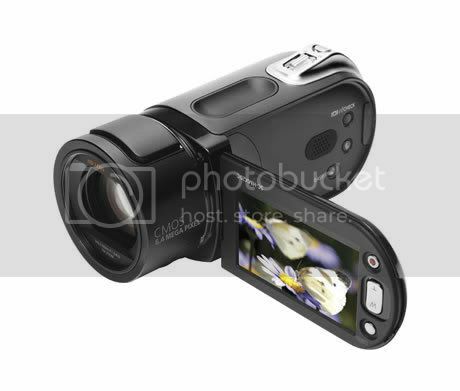 By selecting the Web and Mobile mode, the camcorder’s resolution is automatically adjusted to 640×480 (H.264 / AAC / MP4) and optimized for use on iPod or YouTube. For active users, the MX20 is fully equipped with powerful functionalities in a stylish compact design. The camcorder offers Samsung’s exclusive swivel hand-grip which effortlessly adjusts for regular and those hard-to-reach low angle shots. It also has an advanced 2.7 inch screen LCD which helps users frame their subjects and review footage even under strong sunlight. The MX20 offers useful iCheck and iScene modes. iCheck allows the user to quickly check remaining battery life and memory capacity without wasting time and energy by powering on; iScene allows the user to select up to 10 automatic scene modes for capturing the best footage no matter what environment they may be in. 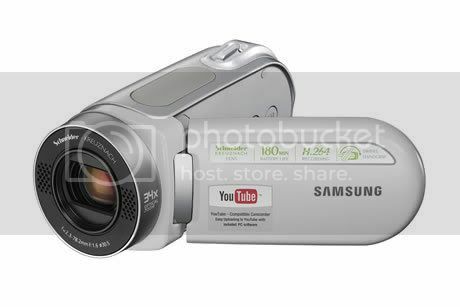 Samsung’s MX-20 camcorder also features a memory card slot for SD/SDHC and MMC+ (up to 32GB). The Samsung MX20, offered in black, white, red and blue will be available in September. Samsung Electronics Co., Ltd. is a global leader in semiconductor, telecommunication, digital media and digital convergence technologies with 2007 consolidated sales of US$103.4 billion. Employing approximately 150,000 people in 134 offices in 62 countries, the company consists of four main business units: Digital Media Business, LCD Business, Semiconductor Business and Telecommunication. Recognized as one of the fastest growing global brands, Samsung Electronics is a leading producer of digital TVs, memory chips, mobile phones and TFT-LCDs. For more information, please visit www.samsung.com. Samsung Electronics Co., Ltd. continues to improve its camcorder offerings with the addition of the HMX20C Progressive HD Flash-based camcorder. Featuring full HD and a1080i mode with 30 frames-per-second recording capability, the HMX20C’s flash-based design makes this camcorder compact and easy-to-use. With an integrated docking station, users will find it simple to not only charge the HMX20C, but utilize the HDMI input and component connectivity to easily view home movies directly on an HDTV. Furthermore, users are able to connect the HMX20C to their laptop or PC via a USB connection and share their home movies with family and friends quickly and easily. For added value and convenience, this multifunctional HD camcorder also delivers among the best still camera functionality within a camcorder on the market – up to 8 megapixels size through pixel-rising technology. The HMX20C’s outstanding performance is the result of a cutting-edge design coupled with innovative technologies in HD recording. The camcorder features a 6.4-megapixel CMOS with electronic image stabilization so that even action-packed scenes project come through with clarity. Featuring an HDMI-CEC (Anynet+) high-quality connection to HDTVs and other devices, consumers can easily control the camcorder through their Samsung HDTV remote while viewing movies – one more feature that strives to make life simpler. With the unique feature of high speed capture and super slow motion playback, the HMX20C allows consumers to record fast motion at 300 frames per second for up to 10 seconds and then drastically slow down the playback of the recording. Perfect for sports fanatics looking to tape and analyze their golf-swing in slow motion, or anyone interested in getting the detail of fast-flying events that otherwise would be undetectable to the human eye, this special function opens up a new world to users. Samsung also engineered its new HD camcorder to be significantly more powerful than previous models. The 8GB of built-in flash memory helps to ensure that nothing is lost for lack of space and users also have the option of recording onto high-capacity SDHC/MMC+ cards via the additional card slot. In addition to ample memory and superb recording capabilities, the HMX20C also delivers among the best still pictures of any camcorder on the market. The HMX20C has a few unique features traditionally found on digital still cameras such as a pop-up strobe flash, an automatic built-in lens cap and advanced face detection to automatically bring facial features into crisp focus, delivering high-quality images. At only 10.9 ounces, the HMX20C fits easily into the palm for quick-and-easy shooting. For further convenience, the HMX20C comes equipped with features that make it straightforward to use. Samsung’s proprietary swivel hand-grip makes it possible to record from multiple angles, including regular and low-angle shots, while the 2.7-inch wide-aspect touchscreen LCD makes editing on the fly easy. Additionally, the iCheck function lets the user know how much memory and battery life remains to ensure not a second is lost. Finally, Samsung has designed the HMX20C to be both stylish and ergonomically correct. Its design utilizes trends seen in the fashion and car industries, resulting in a camcorder that’s as elegant as it is practical.